Michael Dermer is an entrepreneur, speaker, and lawyer, widely hailed as a pioneer of the movement to reward employees for healthy behavior. Just a few years out of law school, Dermer left a coveted job as a corporate lawyer to pursue the dream of being his own boss. With a bold idea—rewarding Americans for healthy behavior and, in the process, saving the healthcare system a bundle—Dermer started IncentOne. For ten years, he worked to motivate a team, convince the healthcare industry, win customers, and get buy-in from skeptics. Finally, on October 15, 2008, after landing plum customers like Deloitte and General Motors, Dermer clinched a private equity investment that should have put IncentOne on the path to billion-dollar riches. Then, the Great Recession struck. In ten days, his dream spiraled into a nightmare. Bankrupt customers. Angry investors. Credit and capital gone. Dermer found himself scrambling to save the business he took a decade to build. After two years of toiling, furiously and tirelessly during 20 hour days, he successfully recovered and sold IncentOne. 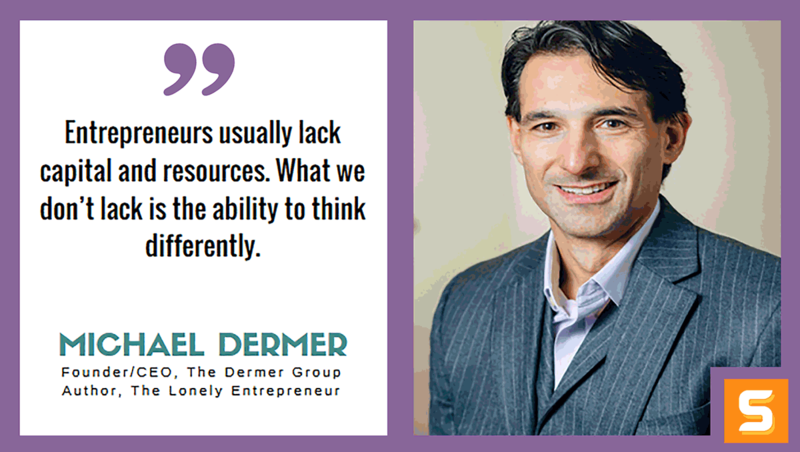 In the process, Dermer discovered something – that the difference between his success and failure was overcoming the flawed perspectives that develop in the struggle and under pressure and the value of seeing everyday challenges in a different light. In this interview with Startup Savant, Michael shares some notable and actionable insight about his book, "The Lonely Entrepreneur". He's on a mission to help every entrepreneur worldwide turn the greatest pressures, problems and struggles into success. Keep reading and take notes! I would advise two things. First, embrace your journey as an entrepreneur not as a job but as an identity. When it is an identity, you embrace the process of becoming a better entrepreneur – just like a mother tries to be a better mother. Second, I would find a group of people who will be honest and candid with you about your idea. Congratulations on the new book! Can you tell us what this book is all about? Its purpose? The Lonely Entrepreneur is designed to help entrepreneurs with the one issue we all face – the struggle. It is based on my personal story of watching the business I had built in healthcare over a decade nearly be destroyed in ten days by the financial crisis of 2008. Through the process of saving my company and successfully selling it, we discovered a methodology that could help all entrepreneurs with the struggle. It is based on the notion that when we are under the pressure of being the entrepreneur, we developed flawed perspectives that stunt our progress. Thinks like “I have to do everything” and “I have to chase every customer”. The book and the tools at www.lonelyentrepreneur.com help entrepreneurs change their perspective from these flawed perspectives to ones that empower us to thrive. Who or what inspired you to write “The Lonely Entrepreneur”? I had no plans to write The Lonely Entrepreneur. After I sold my company, I was working in a strategy role for the company that bought me and taking a step back after working hard for over a decade. At the same time, I was doing some entrepreneur coaching and noticed that the one common theme amongst all of the entrepreneurs I was coaching was the “struggle”. And one of them said to me, being an entrepreneur is lonely. And it struck me – there really wasn’t a trusted place that entrepreneurs could turn to that, understood their struggle and could provide solutions from someone who had been in their shoes. After my own experience, I could not sit by and watch entrepreneurs who put their heart and soul into their businesses struggle. That led me to write The Lonely Entrepreneur. The Lonely Entrepreneur is really a movement that unleashes the potential of entrepreneurs worldwide by turning the pressure and passion they feel into success. How can “The Lonely Entrepreneur” help thriving businesses and struggling entrepreneurs? The Lonely Entrepreneur recognizes that entrepreneurs – whether they are in thriving businesses or struggling enterprises – are all under pressure. And when we are under pressure, we developed these flawed perspectives that stunt our progress. Whether thriving or struggling, it is the ability for the entrepreneur to recognize these flawed perspectives, change them, and that can often be the difference between success and failure. This is what The Lonely Entrepreneur provides across all the common business and personal issues all entrepreneurs face. Can you share with us some interesting parts of your book that could help entrepreneurs overcome failures? For example, if a fashion designer would look to sell a stylish red dress through retail channels such as Macy’s or Bloomingdales, they might face a lot of competition from existing red dresses. But if they took the same red dress and offered it as part of a personal shopping experience for new lawyers and investment bankers in major cities, they might have no competition at all. Entrepreneurs must find playgrounds where no one else is playing. Another is what we call “why build a rocket when NASA has many.” Entrepreneurs feel that we have to build our business from the ground up. But if we have a good idea, but lack capital, resources and distribution, wouldn’t it be better to go to corporate America that has no shortage of capital or resources and do a partnership? Sometimes partnering and leveraging your partner’s resources as opposed to building something from the ground up can be a path to bring your vision to life. There are many more in the book and these are just a few that might be helpful. What are the advantages of having a good perspective? How would it shape success? When we try to do everything, we slow down our progress. When we hire someone just because they are the person available, we end up causing more work trying to train an unqualified employee. It is understandable that we develop these flawed perspectives, but when we do, it causes us to make mistakes and stunts the progress of our business. The Lonely Entrepreneur helps change those perspectives to those that help us make progress in our business. Besides writing, what else do you do as an entrepreneur? My mission is to help unlock the potential of entrepreneurs throughout the world. So we have taken The Lonely Entrepreneur methodology and created a series of resources to help people be better entrepreneurs every day. In addition to the book, we launched www.lonelyentrepreneur.com that has a free “Perspective of the Day” as well as online, group and individual coaching services. Our goal is to help entrepreneurs realize their potential and hopefully our resources help them go back to their desk and be a better entrepreneur that day. What does your day-in, day-out look like as an entrepreneur and author? We are building The Lonely Entrepreneur to touch as many entrepreneurs as we can. So in addition to constantly enhancing our content, we spend a good amount of time speaking to groups of entrepreneurs throughout the country. As you can imagine, all entrepreneurs have to deal with the struggle, so it is incredibly rewarding to see our solution help entrepreneurs feel better and do better. We feel that any day that we can inspire the hearts and teach the minds of entrepreneurs is a good day. What is the most exciting moment of your entrepreneurial journey? The most exciting moment was the day the original idea struck me. Our original business was rewards for healthy behavior. The minute the idea strikes you, it is like a new oxygen that fueled your heart and mind for many years. It was the same feeling that I had when I discovered The Lonely Entrepreneur. I feel so fortunate to have had that feeling twice. So now I wake up every day with that excitement fueling something that can help entrepreneurs realize their potential. That feeling becomes like oxygen to entrepreneurs – we need it to breathe. While there are so many exciting moments along the way, that feeling fuels everything I do. Have you encountered troubles or mishaps when starting a business? How did you fix them? To say what happened to us was a mishap would be an understatement. We watched the business we had built with blood, sweat and tears over ten years nearly get destroyed in ten days by the financial crisis of 2008. It took us two years of 20 hour days to save what took ten years to build. And it was really my change in perspective that was the difference between us succeeding and us failing. Looking at problems differently under the greatest of pressures – much like the pressures that all entrepreneurs feel – was really where all the fixes came from. What advice would you give to our readers or young entrepreneurs who want to start a business today? Where should they start? I would advise two things. First, embrace your journey as an entrepreneur not as a job but as an identity. When it is an identity, you embrace the process of becoming a better entrepreneur – just like a mother tries to be a better mother and a golfer works on his golf game. This allows you to engage in a much different way and look at improving as an entrepreneur. Second, I would find a group of people who will be honest and candid with you about your idea. It is one thing to be passionate about it. It is another to talk to a bunch of smart, honest people who will help you make sure your idea is different and viable. If more entrepreneurs did this, I believe we would have more successful entrepreneurs today. If you want to learn more about how to overcome struggles as an entrepreneur, follow Michael on Twitter, connect with him on Linkedin, watch his Youtube episodes or visit The Lonely Entrepreneur website.